Early on in our relationship, the first time I went to Birmingham to stay with Philip, I thought his set up was quite "noteworthy," to be polite. The bathroom and bedroom completely lacked anything of personality. Seriously: No drawings, art, photos, NOTHING, on the plain white walls. (Oh, except for a sheet hung on the windows that Philip used to black out the sun, as if he were some manner of cave creature. Hello Gollum!). I thought I might be dating a sociopath, but then I remembered sociopaths usually at least TRY to appear normal. Surgeons just don't bother. 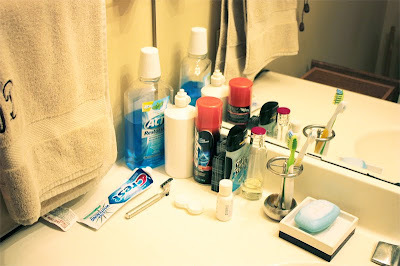 Most interesting was the counter top of his bathroom, on which all of his bathroom "tools" were displayed in an orderly fashion atop two sheets of folded white paper towel. Much as I imagine a table in an OR, so were his bathroom items. The only thing missing was a live-in tech, to whom Philip might bark, while holding out his palm: "Toothbrush! Paste! Dental floss. Hurry, hurry. We've got tartar buildup!" Philip patiently explained that once a week he would replace the folded paper towel with a clean one. 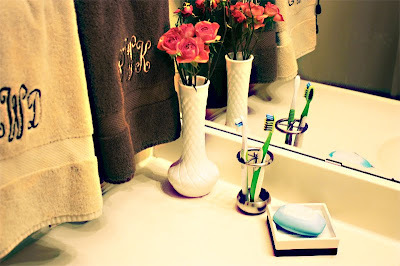 Thus, not only did his bathroom tools remain relatively sanitary, he also didn't have to perform any sort of real cleaning of the counter top at regular intervals like the rest of the population that actually uses the counter as a primary surface. You know, when I think about it I'll bet that most surgeons wish their OR set ups could be applied to everyday life: everything awash in drapes, towels, sheets and latex. All things that can easily be swept up, sanitized or tossed in biohazard bins. More than a few times, I'll bet Philip has wished he could pull a drape between our halves of the bed. I digress, as usual. Philip lived his OR lifestyle pleasantly until I came along with radical ideas of putting art on the walls, using pots and pans, using more than one plate, fork and spoon and, most shockingly, my crazy, newfangled ideas that his bathroom items could sit on the counter top as is, without a paper towel layer between. I KNOW! Have you ever heard such? We took baby steps over the last year. First, the paper towel layer was eliminated. Then, I gently suggested he might not need every single item he owned on the counter top all at once. Instead, maybe those could go into a handy storage contraption called a "drawer," conveniently located right at hip height. And when I say that I "suggested" these things, what I mean is that I repeatedly moved the items to the drawer until he got tired of pulling them out again. You see, he's busy all day cutting things open and sewing them back together and he comes home pretty tired. But I've got nothing but time and patience and am the winner of this battle due to sheer willpower and endurance. But there was one last hurdle: the mouthwash (see middle photo). It kept reappearing. 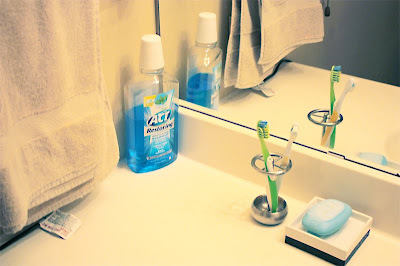 Long after things began to acclimate to their new cozy drawer home, that damn mouthwash held out, stalwart in its ugly plastic bottle, casting its chemical-blue glow across the counter top. Finally, I figured the problem: I was putting it too far away from Philip's drawers, decreasing efficiency by forcing him to take two steps to the right to retrieve it from a separate cabinet. I got the wild idea of lying it on its side and placing it in his set of drawers. I wasn't sure this was going to fly, as it was not sitting upright and I feared that he might be afraid of a leak. But I tried anyway. And lo and behold, ACCEPTED! Please behold the glory of photo 3. I could hardly believe my own eyes. It has now been 5 days and I think we've made real progress: monogrammed towels, a vase with miniature roses and a stainless steel toothbrush holder. My victory is complete. It is a true Christmas miracle.